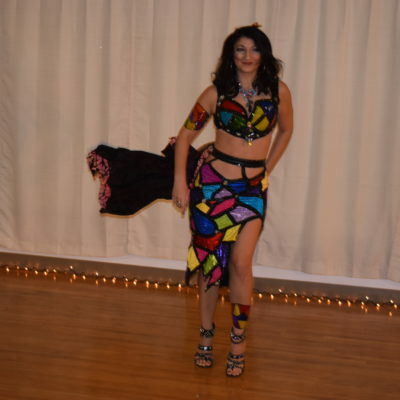 This stunning costume is a collaboration of a design by Mishchief costuming and ourselves. The leather base with amazing scroll work was a part of another costume that Amartia and MAZ wanted to amp up and turn into an amazing Greek design! The leather base has been fully blinged out and the additional elements are all Carpathian. From the flowers to the chains to the hidden evil eyes! This costume also features a peek-a-bo pant leg that truly has that folk feel!